L-R Virtual images of blue, green and red galaxies produced by the EAGLE simulations. The green galaxy is caught in the act of transforming from blue to red as its gas supply runs out. Credit: James Trayford/EAGLE/Durham University. An international team of scientists, led from Durham's Institute for Computational Cosmology (ICC), used new computer modelling of the Universe to investigate the colours that galaxies have and what those colours might tell us about how galaxies evolve. Using the state-of-the-art EAGLE simulations, the researchers modelled how both the ages of stars in galaxies and what those stars are made from translate into the colour of light that they produce. The research team said its simulations showed that colours of galaxies can also help diagnose how they evolve. While red and blue galaxies are relatively common, rare green galaxies are likely to be at an important stage in their evolution, when they are rapidly turning from blue - when new stars and planets are being born - to red as stars begin to burn themselves out. The research funded by the Science and Technology Facilities Council (STFC) and the European Research Council (ERC) is being presented today (Thursday 30 June) at the Royal Astronomical Society's National Astronomy Meeting in Nottingham, UK. Lead researcher James Trayford, PhD student in the ICC at Durham University, said: "Galaxies emit a healthy blue glow while new stars and planets are being born. However, if the formation of stars is halted galaxies turn red as stars begin to age and die. "In the real Universe we see many blue and red galaxies, but these intermediate 'green' galaxies are more rare. "This suggests that the few green galaxies we catch are likely to be at a critical stage in their evolution; rapidly turning from blue to red." Because stars form from dense gas, a powerful process is needed to rapidly destroy their gas supply and cause such dramatic changes in colour, the research found. James added: "In a recent study we followed simulated galaxies as they changed colour, and investigated what processes caused them to change. 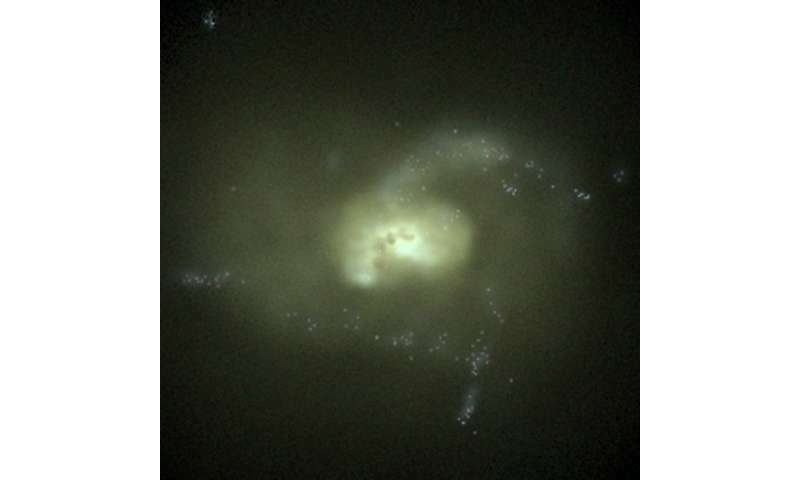 "We typically find that smaller green galaxies are being violently tossed around by the gravitational pull of a massive neighbour, causing their gas supply to be stripped away. "Meanwhile, bigger green galaxies may self-destruct as immense explosions triggered by super-massive black holes at their centres can blow dense gas away." 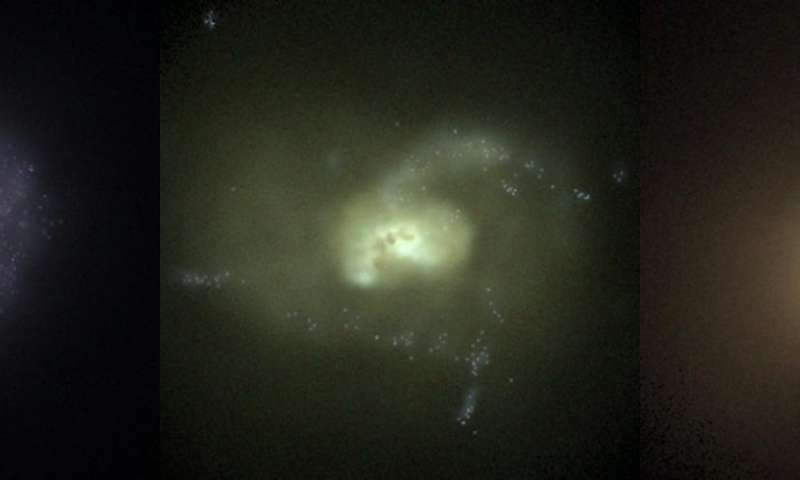 However, the research found that there was some hope for green galaxies as a lucky few might absorb a fresh supply of gas from their surroundings. This can revive the formation of stars and planets, and restore galaxies to a healthy blue state. James said: "By using simulations to study how galaxy colours change, we can speed up the process of galaxy evolution from the billions of years it takes in the real Universe to just a matter of days in a computer. "This means we don't just see galaxy colours frozen in time, we can watch them evolve. Another advantage is that we can remove unwanted factors that may change the colours we see, such as pesky dust clouds that can prevent light escaping from galaxies. "As the EAGLE simulations we use represent a new level of realism, we can have greater confidence in applying these results to the real Universe." More information: It's not easy being green: The evolution of galaxy colour in the EAGLE simulation, Trayford James, W, et al is being presented at the Royal Astronomical Society's National Astronomy Meeting, at the University of Nottingham, Thursday, June 30, 2016.